Calling all girls. It's time for a new Tin Man! Tin Man is one of the most famed Wizard of Oz characters of all, but we're in a new modern era, and it's time for a new take. We'd like the new Tin Man to be female. And we'd really like if she was a toddler. And we'd love it if it could be your girl! Yes, the only requisite for this girl Tin Man is that she be a total cutie, so we're sure that your precious one will fit the bill. Just outfit her with this signature Tin Man toddler costume, and she'll have everything she needs to travel down the yellow brick road. Sounds like a real adventure is going to be coming her way! Team her up with her best friend or sister as Dorothy, and they'll be ready to put a brand new spin on the Wizard of Oz. Or use this cutie patootie costume to complete your family's group theme. When you all travel to the Emerald City together, it's going to be outright magical. 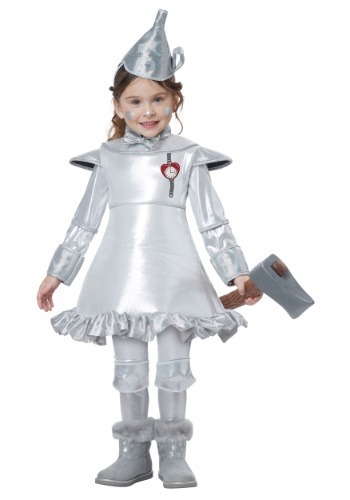 "We're off to see the Wizard..."
Set her up with this costume, and it will have everything she needs to be the new Tin Girl. The foam backed dress gives her a rigid look, but it's much more comfortable than real metal. Just seal the deal with the hat, maybe a touch of makeup, and she'll be ready for Wizard of Oz fun. With toddler/kid sizes in 3-4 and 4-6, outfit your little one with this costume for a real special adventure!